ReelTime VR (OTCPK:RLTR) Reeltime’s CEO/CTO Barry Henthorn has accepted a position as a contributing advisor/author for the Forbes Technology Council. 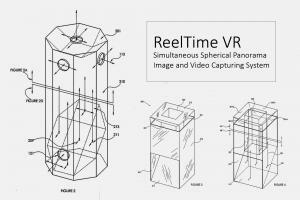 KENMORE, WASHINGTON, UNITED STATES, June 28, 2018 /EINPresswire.com/ -- ReelTime VR (OTCPK:RLTR) Reeltime’s CEO/CTO Barry Henthorn has accepted a position as a contributing advisor/author for the Forbes Technology Council. Mr. Henthorn will provide assistance to other select CTOs and high-level technical executives of notable companies as well as write articles and insights via Community Voice for the technology section of www.forbes.com. Forbes, one of the most iconic media companies in the world has written about Henthorns accomplishes throughout his career and he was chosen as "The Most Innovative Public Company Leader to Watch in 2015" topping the list of Corporate Innovators to Watch included in the March 2015 magazine. The list highlighted a few of Mr. Henthorn's past accomplishments such as his creation of the V.O.P.T. voice protocol which paved the way for the elimination of expensive long distance worldwide. It also outlined his contributions as the architect of grid-based distribution of video via the internet which allowed full DVD quality streaming online. Mr. Henthorn was also the creator of the "Free Cellular Phone" which transformed the cellular industry and how consumers obtain mobile devices throughout the United States and beyond. This week Barry is featured in a spot that airs on CNBC during Shark Tank that helps entrepreneurs and inventors navigate the patent process highlighting ReelTimes VR’s new Virtual Reality Technology Patent application based on one of Henthorn's inventions. The Forbes Technology Council is an invitation-only community for senior-level tech executives. Members are recruited and selected for the Council not just on the basis of career success, but on their diversity of perspective and willingness to give as much as they gain based on their depth and diversity of experience. The council brings members together in communities tailored to their industry so that they can connect with others best positioned to help them overcome challenges and create new opportunities as well as weigh in at the highest level in the private sector and government on policies and emerging technology trends as experts. About Forbes Magazine: Forbes is an American business magazine. Published bi-weekly, it features original articles on finance, industry, investing, and marketing topics. Forbes also reports on related subjects such as technology, communications, science, politics, and law. The magazine is well known for its lists and rankings, including of the richest Americans (the Forbes 400), of the world's top companies (the Forbes Global 2000), and The World’s Billionaires. The motto of Forbes magazine is "The Capitalist Tool". Its chair and editor-in-chief, Steve Forbes, and its CEO is Mike Federle. It was announced on July 18, 2014, that a majority stake in the publisher had been sold to a group of investors through their vehicle Integrated Whale Media Investments. About ReelTime VR: ReelTime Rentals, Inc. DBA ReelTime VR www.reeltime.com is a publicly traded company based in Seattle, WA (OTCPK:RLTR). 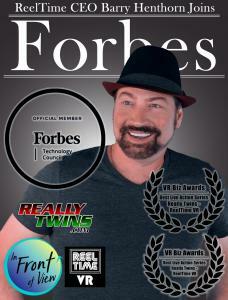 ReelTime is in the business of developing, producing, and distributing Virtual Reality Content and technologies. We have end to end production, editing, and distribution capabilities for internal and external projects. 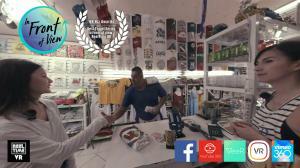 ReelTime Currently produces three ongoing series for the Samsung Gear VR platform and distributes them over numerous VR delivery portals including Gear VR, Oculus, Veer VR, HTC Vive, YouTube 360, Facebook, and others. ReelTime Media also publishes the book “It Was Always Me – Edwards Edwards the most Prolific Serial Killer of all time Which has been the subject of a cover story on People Magazine, Rolling Stone, In Touch, and a six-part series on Paramount network, found at www.itwasalwaysme.com.